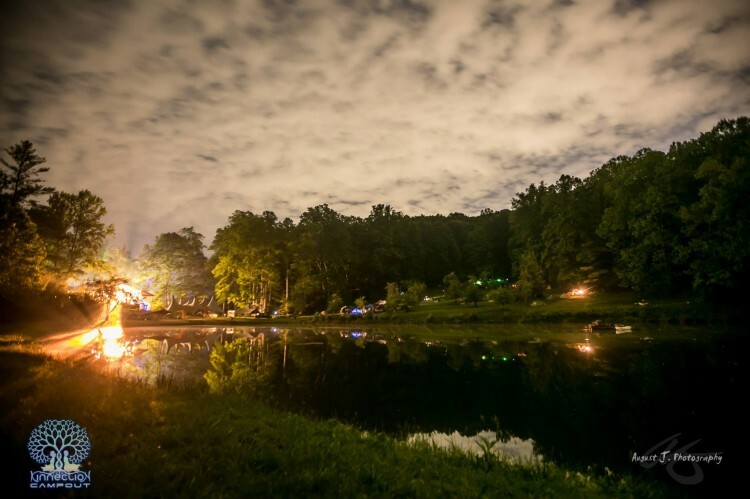 Kinnection Campout is one of the very the sweetest Earth lovers gatherings, coming up next weekend. 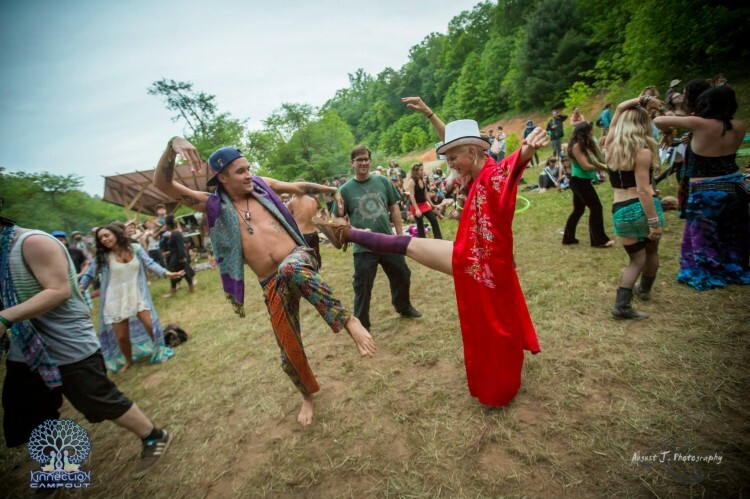 Deep community, permaculture, ecstatic dance, campfire, workshops, music music music, yoga, Appalachian breeze in the trees. A juicy juicy weekend to nourish your soul. This review is from Daily Beat by Liane Robinson, photos by August J. Photography. 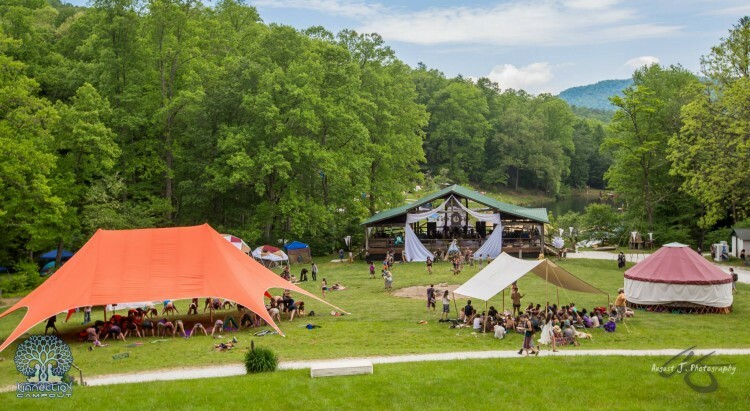 On a gorgeous weekend in mid-May, something intentionally beautiful blossomed in a tucked away region of the southern Appalachias just outside of Asheville, North Carolina, as hundreds of eco-conscious and community minded individuals converged for Kinnection Campout. This four day gathering was truly a special occasion surrounded by a celebration of music, dancing, learning, interconnectedness and growth. The small, intimate gathering (of about 2,000?) along with the lack of cell phone service and paired with the simple, organic beauty of its home on the magical and sacred lands of Spirit Crossing, allowed everyone to let go of their outside burdens and truly embrace the moment as it unfolded. 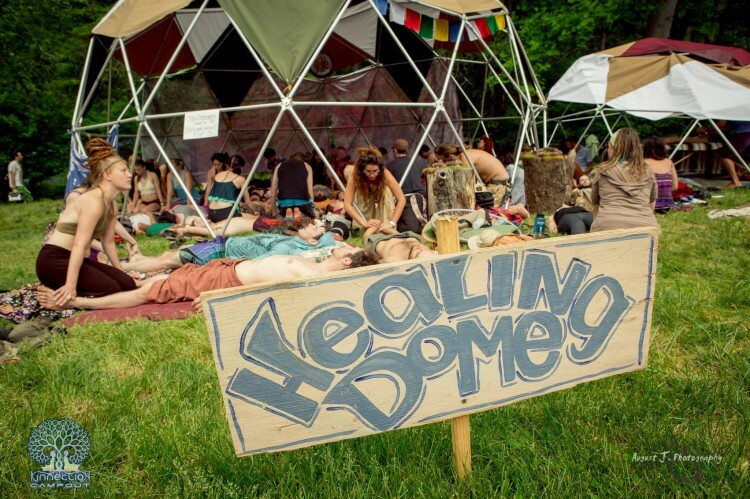 Kinnection has been a staple in the South East for years as they are known for bringing together world renowned artists, healers, visionaries and environmental warriors to establish and build a more conscious community that in turn helps form the transformational vessel that is Kinnection Campout. There was a feeling in the air as soon as you stepped on the grounds; the fresh mountain breeze, the warm, genuine smiles radiating from everyone’s face and the sheer hard work and dedication that went into the event were felt immediately. There were no cars allowed near your campsite but it didn’t seem to phase anyone as neighbors helped carry bags and assisted each other in setting up tents. Instead of being shuffled into 10’x10′ boxes to camp we had free range to set up anywhere on the property; whether you enjoy being next to the lake, hidden among the trees or situated right next to the creek, the options were limitless. The weekend kicked off on Thursday evening with the Welcoming Ceremony which took place at the Air Temple stage, a pavilion like structure overlooking the upper lake and decorated with flowing white silks and plenty of comfy rugs and pillows for an intimate setting. As we sat down and gathered around the lotus shaped podium we got to know the new friends we were surrounded by as we listened to the Master of Ceremony, Ehren Cruz, who set the tone for the weekend. The air was cool and there was a slight breeze blowing through the silks as we listened to Ehren’s encouraging words of letting go; letting go of fears, apprehensions, ego or burdens. He urged us to move beyond the small talk- the ‘Hi, How are yous’ and ‘my name is’ as he ensured us that we were already on a deeper level with one another and that moving beyond the surface is what Kinnection is all about. He spoke about living through your passion and taking joy in sharing that passion with others and invited us to turn to our neighbor and tell them what brought you to this moment and what you hope to gain over the course of the weekend. Ehren’s words were powerful and resonated throughout the entire gathering as we were all there for something deeper and more meaningful. It was only a few hours into the weekend and already everyone seemed right at home, embracing each other, sharing stories and exchanging in meaningful conversations. It was clear something special was taking place here. 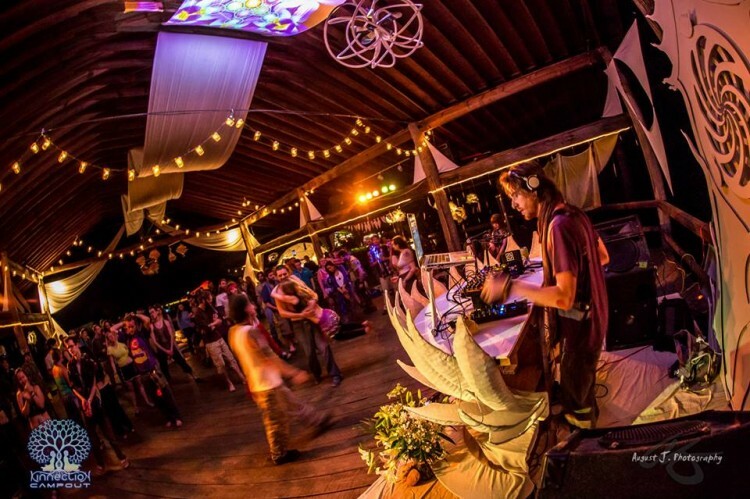 What sets Kinnection Campout apart from other gatherings is that in addition to bringing a world class lineup featuring musical artists such as Kalya Scintilla, Desert Dwellers and OTT, the list of workshops were just as long and impressive. For most, it wasn’t just the music that brought them to Kinnection but also the opportunity to expand their skill set, learn something new or connect with someone who has similar interests or hobbies. Sometimes it can be difficult to make most workshops because you don’t want to miss any music but at Kinnection they made it a point to start the music late in the day so that we could spend the daytime learning uninterrupted. You could spend your morning doing acro-yoga, practicing thai massage, going on plant walks, hearing about the art of beekeeping, exploring permaculture, gardening techniques or learning how to make and play your own didgeridoo. The workshop lineup was well organized and gave campers a variety of options to explore their curiosities and hone in on their passions. Kinnection Campout implemented an elemental theme this year, emphasizing the importance of fire, water, air and earth by offering a safe space to represent and honor these life essentials. These elements shape the face of the planet and all the life upon it and Kinnection allowed us to reconnect with our roots and truly appreciate how these energies affect our lives daily. 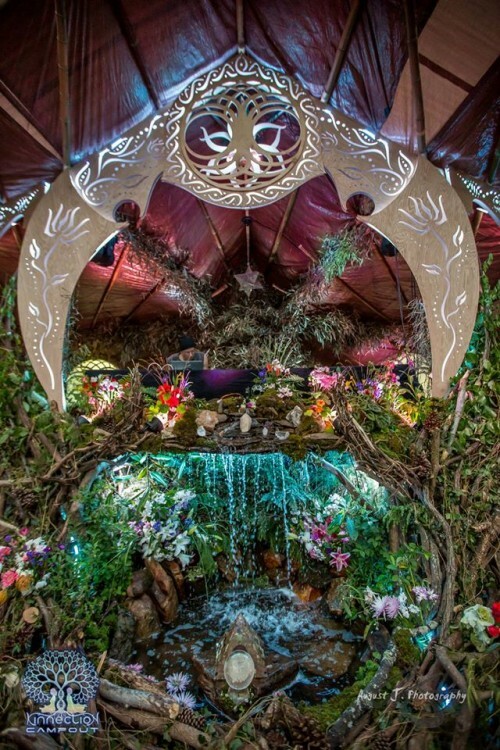 Among the countless reasons Kinnection absolutely blew me away was the attention to detail; from the water alter on the lake dock, to the sacred fire that stayed burning around the clock, to the Earth Stage complete with a running waterfall to the Air Temple stage being the perfect place for grounding, there was always somewhere to go to find safe space. For the art lovers, there was live art happening nightly by the main stage by artists such as Emily Kell and Andy Reed as well as being displayed in multiple places throughout the venue. One of the biggest issues for gatherings of substantial size is dealing with the waste; as a frequent festival goer, green team volunteer and avid recycler, I am always looking to see how festivals manage and monitor their environmental footprint. Kinnection gets an A+ in this category as it was the cleanest gathering I have ever attended. Kinnection went beyond the “Leave No Trace” ideal and implemented a “Pack it in, Pack it out” policy which everyone gladly abided by. There were plenty of clearly labeled bins for compost, recyclables and trash throughout the venue and everyone seem to make it a priority to properly dispose of their trash. The wonderful folks at Tribal Council put copious amounts of love and dedication into this event; from the lineup, to the workshops, to holding safe space for learning and community building, it was an incredible and unforgettable weekend. It’s emphasized that Kinnection is not to be labeled as a festival, as that can be seen and understood as only a big party and what we were all trying to create here goes far deeper than anything we had ever imagined when we first arrived. Kinnection let us know that we are warriors of the planet, creating conscious community and paving the way for future generations to live and thrive. We look forward to relishing in the afterglow of this one for a while as we look forward to returning in 2018!